Bike power complete. Bike, bike stand, 3 phase rectifier, capacitor, 6 Amp solar battery charge controller, 12V bulb. The bike ( on a bike stand ) were attached to the 3 phase rectifier and the 1 Farad capacitor to produce 12V DC. The wheel is a 200 W 36V wheel so the bike could only be operated at a low ( comfortable) speed to prevent too much voltage and too much current. A 12V 50W dichroic light bulb was added to show it was really working. capacitor at 13.6 Volts and 50Watt 12 Volt dichroic light working. PV charge controller added using the bike as the power input instead of the solar panel and battery charger was used. Probably best for charging a small device unless you want to pedal the bike for a long time. 36 to 12 volt step down for a higher current lower voltage system. replace the back tire with a smooth tread tire. Posted in 12Volt, Bicycles, Collapse scenario, Electrical, Energy, Human powered, Long Emergency, Long term, Sudden crisis. Depending on where you are you might want electricity. Solar power is a convenient, low maintenance way to get electricity if you have sunlight. For this example I will consider a 80W 12 V solar panel and a charge controller capable of 6A at 12 Volts. Close enough to matched, remember the panel lists it maximum power not typical power rating. A charge controller is a fancy battery charger which can put unused solar power into stored energy into a battery. Usually there is a load circuit for things you want to run directly off the solar panel and a battery charging circuit. For this example there is a maximum load of 72 watts from the controller load wires. For a larger load than the controller allows disconnect the battery from the charge controller and use the charged battery. There is often a wet type battery for flooded lead acid cells check you documentation as to whether it is connected to the positive(+) or negative (-) terminal of the flooded battery. 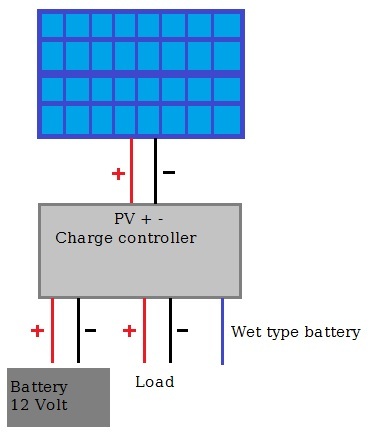 PV charge controller and battery wiring diagram. For 12 Volt setups the car cigarette plug and socket system of connectors is a good idea, simple and common. There is also a wide variety of electrical items made especially for this connector format. The connectors on solar panels are waterproof, the connections on the charge controller are not, make sure they are waterproofed or kept away from water. Posted in 12Volt, Battery, Collapse scenario, Electrical, Energy, Long Emergency, Long term, Solar PV. Power for an electrical system is relatively easy to determine. Power is energy consumed or release in a given quantity of time. Power is different from energy as energy is conserved meaning it cant be created or destroyed. Power can be increased or reduced by altering the amount of time the energy is exerted over. In the normal mechanical world energy is either potential or kinetic. If we consider a ball being raised 1 meter of the ground in a period of 2 seconds and then dropped to the ground reaching the ground in 0.5 seconds, the balls combination of potential and kinetic energy levels remain the same. However the ball has gained power by expending its energy in a short period of time. this is the subtle difference between energy and power. Only 1/4 of the power released was used to raise the ball. Power is simply how quickly energy is stored or expended. Posted in Educational, Electrical, Energy. The easiest way to understand basic electrical theory is to consider the flow of electricity through a wire as being like a fluid flowing through a pipe. We will consider two reservoirs connected by a pipe with one reservoir being higher from the ground than the other, and a pipe connecting them. Battery analogy: Fluid moving between reservoirs through a pipe, forced by gravity. What happens in this situation should be obvious. The fluid will flow until there is no fluid in the top reservoir above the level of the outflow pipe. Flow will be fast at first and close to the end flow will be slow. Almost the exact same things are observed for a battery. If we consider pressure the fluid exerts on the pipe it is similar to voltage in an electrical system. The flow of the fluid in the pipe is similar to the current in an electrical system. The diameter of the pipe is similar to resistance in an electrical system. 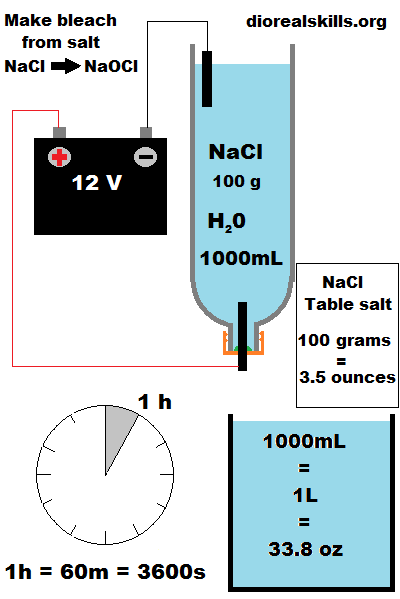 The total quantity of fluid in the system is similar to total charge in an electrical system. Voltage is equal to current multiplied by resistance. Warning: The diagram shows a battery in whats called short circuit configuration. short circuits should be avoided as they can lead to dangerous destruction of the battery. Posted in Educational, Electrical, Energy, More to come. The 12 Volt car adapter is a very popular source of DC power so its worth knowing more about its parameters. 12V adapter. positive and negative contacts labeled. 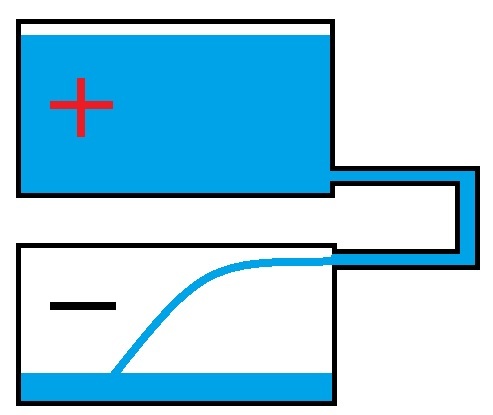 Red arrow shows direction of rotation for access to the fuse under the positive contact. 20-25mm in diameter and 50mm long. Positive contact at the tip and negative contact on the side. The negative side contacts are usually attached to springs to hold the device secure. Frequently one of the negative side contacts may be not electrically connected and simply to help hold the device in place. Under the positive contact there may be a spring and a fuse, which is normally a 2Amp fuse. Some adapters in this format may support 24 volts as some truck electrical systems are 24 volt. Posted in 12Volt, Connector, Electrical, Energy, Repair. Once in the dark you won’t be able to easily see what you’re doing. You may have a torch and have the option of holding it in one hand and attempting to do things but this may really get in your way. You may need both hands free. Of course you could hold the torch in you mouth or in the crook of you neck. A simpler solution? A head torch. A head torch frees up you hands an the light is always on the area you are looking at, a lot of problems solved. 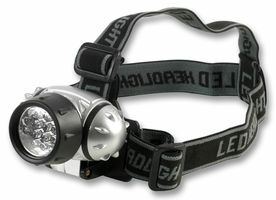 A basic single unit head torch with overhead strap and 12 LEDs. Single strap: A single strap that encircles you head like an elastic headband. Minimalist but not as secure at the over head strap and not appropriate with heavier lamps. Over head strap: Like the single strap but with an additional strap that goes over your head to hold the lamp more firmly but at the expense of having to remove other head gear to put it on or take it off. Single unit: the entire lamp batteries and switch are in one unit at the front. Separate battery compartment: Batteries are separate to the lamp often at the back to counterbalance the weight of the lamp or possible to be worn on another part of clothing. external battery packs can get in the way and they is always the worry of the wire that connect to the lamp itself getting dislodged or damaged. White/white blue LED : One or more LED in the blue-white spectrum give of a diffuse glow of light extending about 5 meters. good enough to walk an night or fiddle with an object. A single LED can last for a hundred hours of operation for one battery charge. Red LED: One or more LED in the red spectrum which allows you to intermittently use the LED occasionally without greatly affecting your night vision. Excellent for reading maps at night. Red light does not radiate far and is quite discrete at night, many animals can’t see red light- even at night. Halogen / high lumen blub: One or more ultra bright focused beams that create a very strong cone of light stretching for 50 or more meters, great for looking at more distant objects at night. These lamps have a tendency to really drain batteries fast. In terms of battery life you are looking at 10-60 minutes of operation. Ultra violet: I haven’t seen these on head torches yet but if you are a little electrically inclined you might consider adding one. Why? 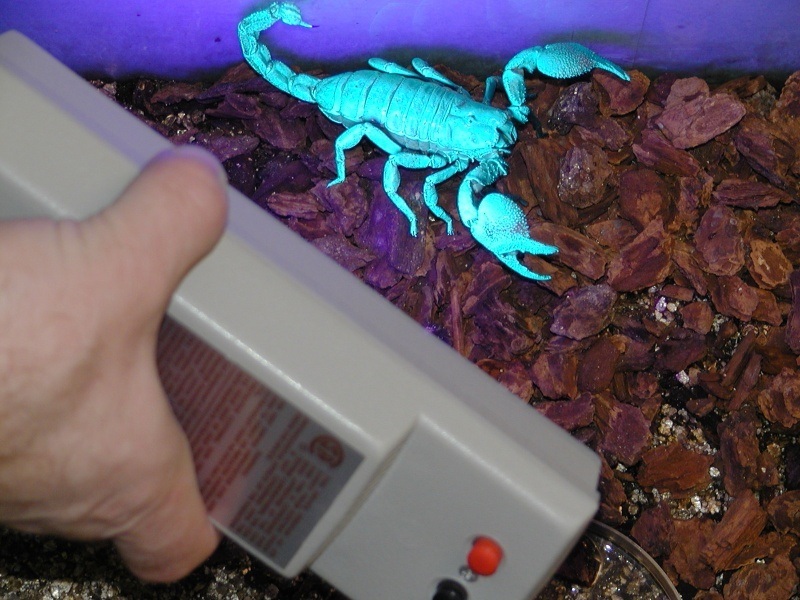 If you are in an area where there might be scorpions like Central Australia, you’ll find out that scorpions and some other insects actually glow under UV light. Pretty handy for avoiding a nasty sting. Cree LED: Super bright with power consumption similar to a standard LED. The illumination is about 200 lumen ( the combined brightness of 200 candles) They are usually in a focus adjusting tube with a over the head strap configuration .Theses headlamps are new to the market and some are selling at very low prices, get in fast on these they are very good value for money. Commonly AAA size batteries are used, sometimes because of the electronic switching involved, rechargeable batteries cant be used. In higher light output head units CR 123 batteries are often used they are more expensive, obscure and harder to find that other batteries. Wind up: if this is the only power supply you will find winding up a torch a lot gets a bit old really fast and as a consequence the batteries never really get a full charge. Investigate adding an alternative charging modification. Solar: You will need to leave this in the sun a long time to get the charge required. External charge plug: Great idea if it can be made waterproof perhaps with rubber cap or similar. Hopefully the charge plug is not really obscure in-case it gets lost. These seem to be more complex than needed. Often there are several light modes switching on various arrangements of LED’s or Lamps and may include a flashing feature. One torch i had had the annoying feature of refusing to respond when at low current forcing the torch into a stay on and go dead mode. the only way to avoid this was to take the batteries out to turn the lamp off. Other important considerations. The head torch will need to be water resistant at least, preferably waterproof. Cheap head torches can malfunction quite quickly. I bought two different ones recently that simply didn’t work at all, straight out of the box. Single unit, using rechargeable batteries, at least 3 White LEDs, simple on/off switch. Head torch $15 and upwards depending on features. Cree LED because of brightness and battery life. Posted in Electrical, Long Emergency, Long term, Scram Bag, Sudden crisis, Uncategorized.